The original flying testbed N747GE landing at Tucson, Arizona. 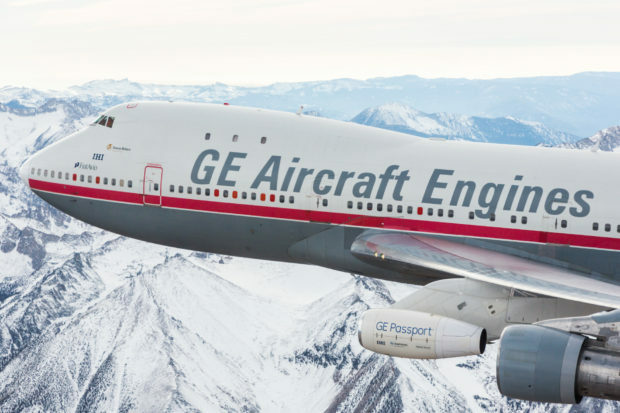 Engine manufacturer General Electric (GE) has completed the final flight of it’s original 747-100 flying testbed. The aircraft N747GE was the oldest active 747 in the world. It was the 25th 747 to roll off the line in October 1969 and was delivered to PanAm in March 1970 as Clipper Ocean Spray. GE acquired the aircraft in 1992 when it was around 23 years old. The aircraft was then converted to a test bed which involved significant modifications, including removing seats, strengthening the left wing and tail for flight testing and installing data systems. The original flying testbed N747GE in it’s original colors.Testing the GE passport engine. The first engine to be tested on the aircraft was the iconic GE90. 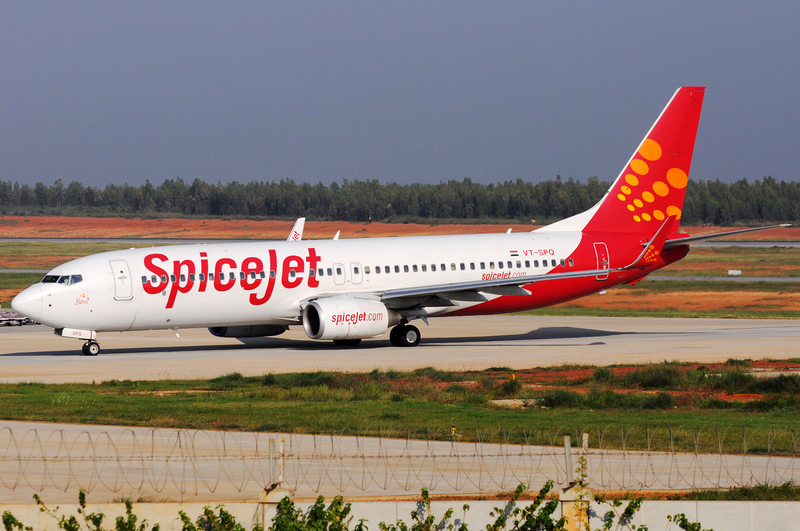 The aircraft was involved with development of more than 11 distinct engine models and 39 engine builds, including widebody engines likes the GE90, GEnx and the Engine Alliance GP7200, CF34 engines for regional jets, narrow body engines like CFM56 and LEAP, and the Passport for business aviation. 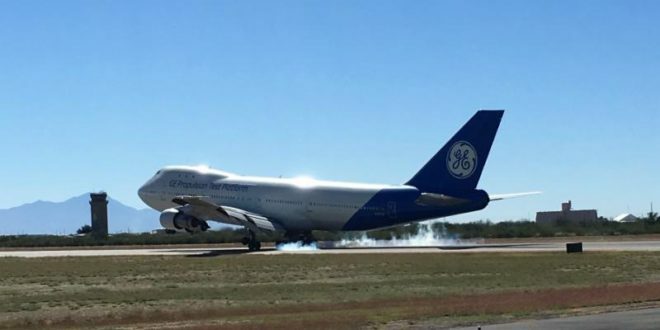 GE flew the plane on its final test flight on January 25, 2017. 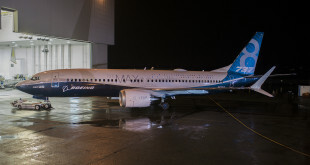 The aircraft flew it’s final flight from GE’s Flight Test Operation in Victorville, California to the Pima Air & Space Museum in Tucson, Arizona where it will be displayed. Through it’s life it flew a total of 90,000 hours and 19,251 cycles. Both test beds in 2015 with General Electric Passport 20 on Boeing 747-100 (red stripe) and General Electric LEAP-1A on Boeing 747-400 (blue tail). The original testbed has been replaced by another 747, a -400 that GE acquired in 2010 from Japan Airlines. 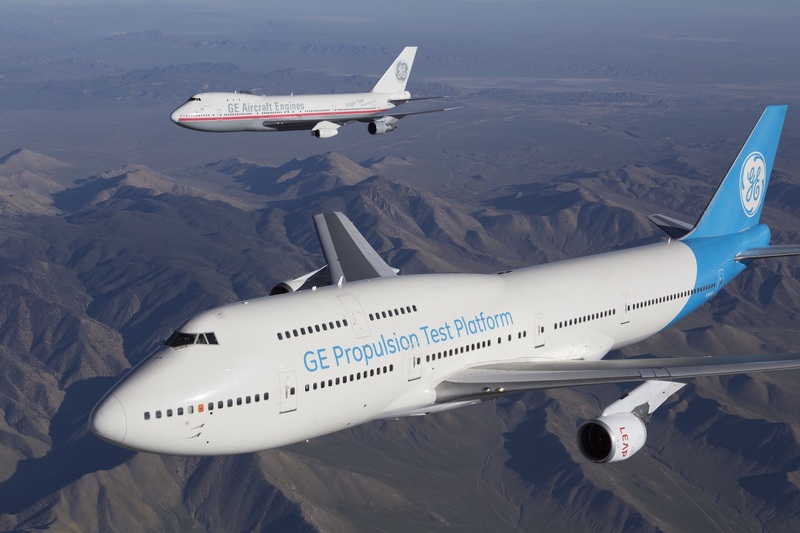 GE converted the aircraft into what it calls the Propulsion Test Platform (PTP). Powered by GE CF6-80C2 engines, GE has stated that the new PTP offers better capabilities and improved integrated systems compared to the older flying test bed. The PTP has flown missions for the LEAP and GE9X engines.